Lips of bulldog, cheek of chipmunk, toe of ?? The lovely face of a greater bulldog bat. Photo by Jon Flanders. Hi everyone! I hope you all had a good week! I did because we got a snow day on Wednesday. We got about an inch of snow before it started sleeting. The wonderful people in charge decided that it wasn’t safe for us to go to school. It was wonderful! It was glorious! And then to add to the gloriousness, we got a 2 hour delay the next day! It was great! I hope everyone else enjoyed their snow days as much as I did. I was looking up interesting bat species and I found one called the Bulldog Bat. I think this bat is really cute. Of course, all bats are cute, but I might be a little biased toward this one because it looks a little bit like my pug. The name Bulldog Bat actually is used to describe two different species of bats that live in Central and South America. These bats hunt over water. 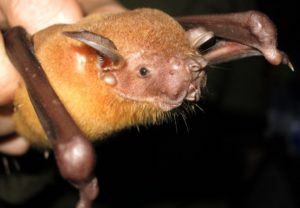 As their name suggests, these bats have big lips and a flat squarish muzzle that makes them look like a bulldog. They also have cheek pouches that they use to store food in. 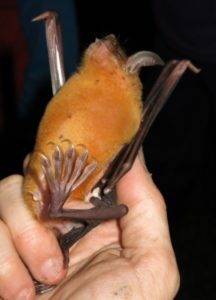 These bats have very large hind feet with hooked claws. They use their claws to catch prey from the surface of the water. The Lesser Bulldog Bat eats mostly insects. The Greater Bulldog Bat eats fish. Once they catch their prey, they chew their food and store it in their cheek pouches to finish later. The Lesser Bulldog Bat uses echolocation to find its prey. The Greater Bulldog Bat skims the top of the water echolocating on ripples made by the fish. One problem the Bulldog Bat has with hunting over water is that they get wet wings, however these bats actually have an oily substance coating their wings that makes them water repellent. If you would like to read more about these bats, you can find information here and here. Fishing feet! Long toes for grabbing fish just under the water’s surface. Amazing! Photo by Jon Flanders. Previous StoryScorpions, and nectar, and crickets, oh my!